Anytime is a good time to replace your watch strap, especially if you take pride in style and enjoy diversifying your timepiece. Switching up your watch band is actually really simple and a great way to subtly change your look for varying occasions. If you’d like to replace your watch band with a new one, just like tailoring a suit, you will need to know what size band to get. In this watch size guide, we will detail different ways to find that measurement. The easiest way to find your band size is to check the back of your current watch band for a stamping, such as in the example below, that indicates the size in millimeters. Experienced and professional watch band manufacturers will always include this stamping. 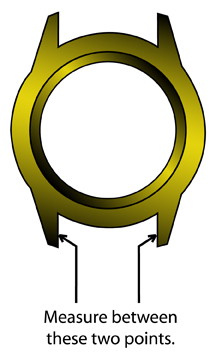 If there is no indication of size on the back of your old band, then make a measurement between the lugs where the band attaches to the watch as indicated in the image below. You may use a ruler or a plastic caliper, if you have one. NOTE: If you intend to continue using your old buckle, you will also need to measure the width between the points where the band attaches to the buckle. Use the conversion guide below to find your watch size if you do not have a ruler or measuring device that has millimeter settings. Next, you will need to know what length of band to buy. 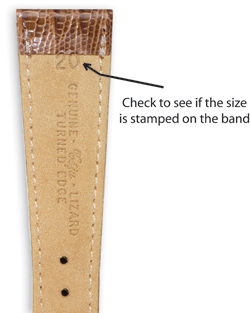 Determine the length of your band by measuring the length of both pieces together without including the buckle. Use the watch band size chart below as an example. Our watch band size guide and charts are all you need to find the perfect new watch band for your timepiece. View our collections to find a luxurious watch band that will make your timepiece look brand new.